All you need to say is the name SLS AMG Coupe to fans of supercars to conjure images of gull wing doors and an epic exhaust note from a massive V8 engine. Now, Mercedes-Benz has unveiled a new version of the SLS AMG Coupe that ditches that V8 engine in favor of an all-electric powertrain. This is the new Mercedes-Benz electric supercar. 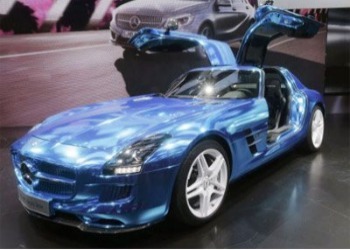 The new car is called the SLS AMG Coupe Electric Drive and is powered by a quartet of electric motors. Each wheel gets its own motor and the motors combined to produce 740 HP and 737 pound-feet of torque. The electric-powered car is able to hit 62 mph in 3.9 seconds. That’s only a tick behind the gasoline-powered version of the car. The vehicle also uses a KERS system developed from the Mercedes-AMG Formula One team. Using a standard outlet the car would need 20 hours to recharge fully. A quick charger is available that will fully recharge the battery packs in just three hours. When the car launches it will cost approximately $537,930(USD) – about $300,000 more than its gas-powered older brother.